I am not sure what it is about the end of summer, but it totally makes me want to make jams and jellies. 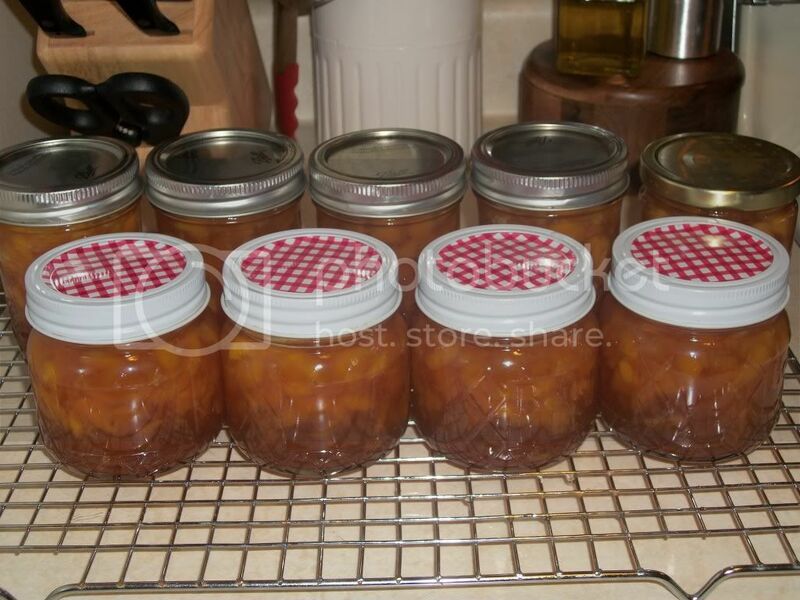 One of my favorites to make is Peach Jelly. This jelly is best to eat in the middle of winter because it reminds you of summer. It's like summer in a jar! 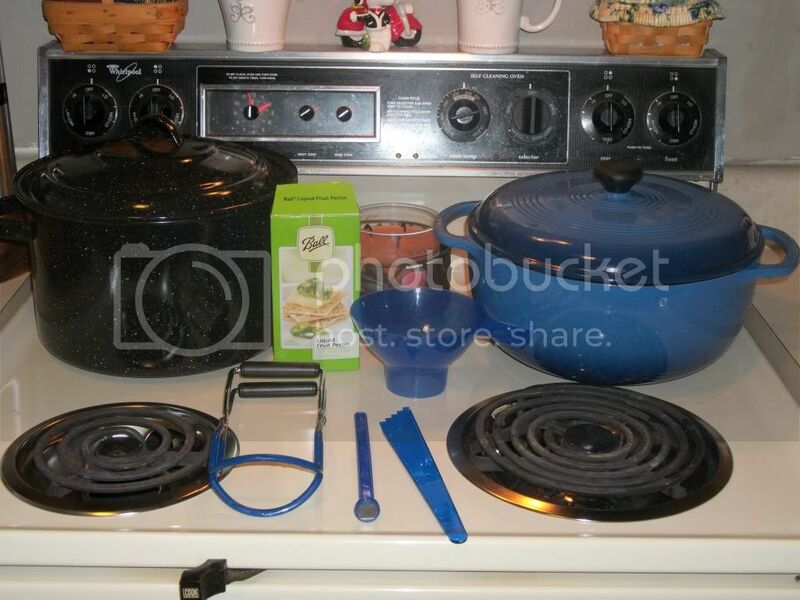 A dutch oven (love my blue one! ), a large pot for processing (got this black one at Walmart for around $10), canning tools (the 4 blue tools were in a canning kit I picked up last year), pectin, jars/lids/rings, and of course fruit! We got these beauties at the farm market near my parent's neighborhood. We got all of these, and about 10 others my Mom kept, for only $12! 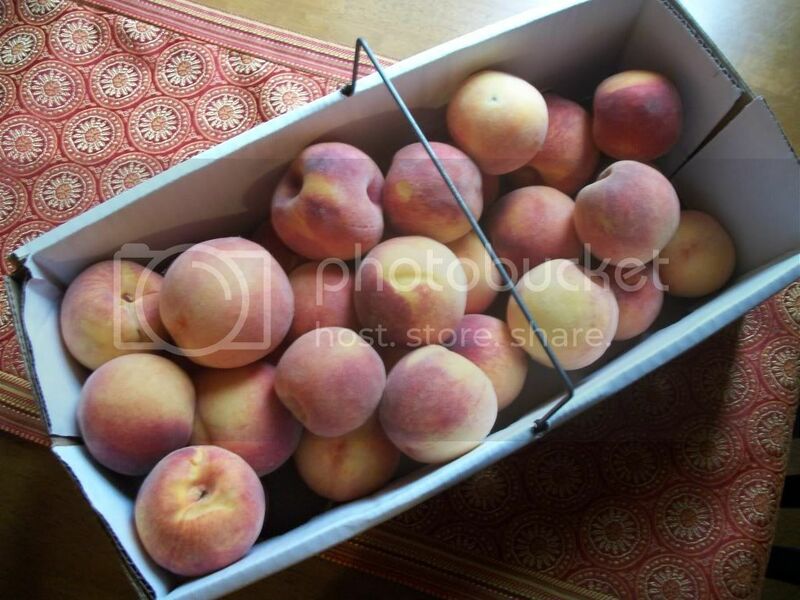 There were probably about 40 peaches in that basket! I have been eating them on my oatmeal all week and they are so ripe and sweet! 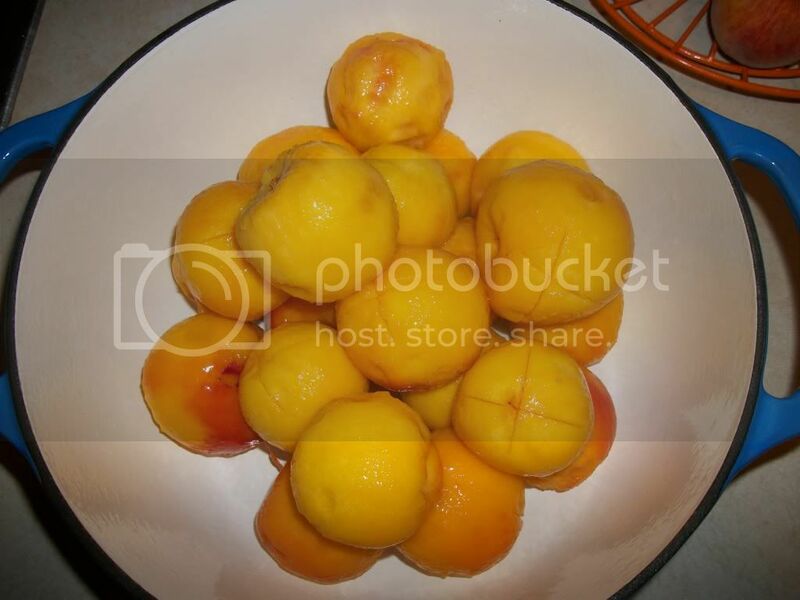 You then immediatly take the peaches out and put them in ice cold water. 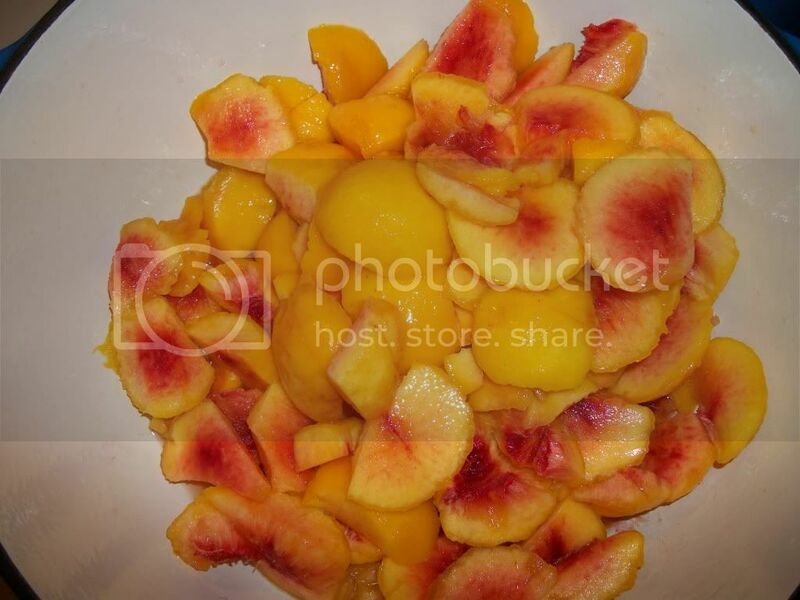 This will then help you peel the skin off the peaches. The more ripe they are the easier they are to peel. Here they are all peeled. You can see where I cut the X's into the bottoms of them. That's ok, you will then need to cut them up anyway. Please note I used about 20 peaches, but many of them were small. 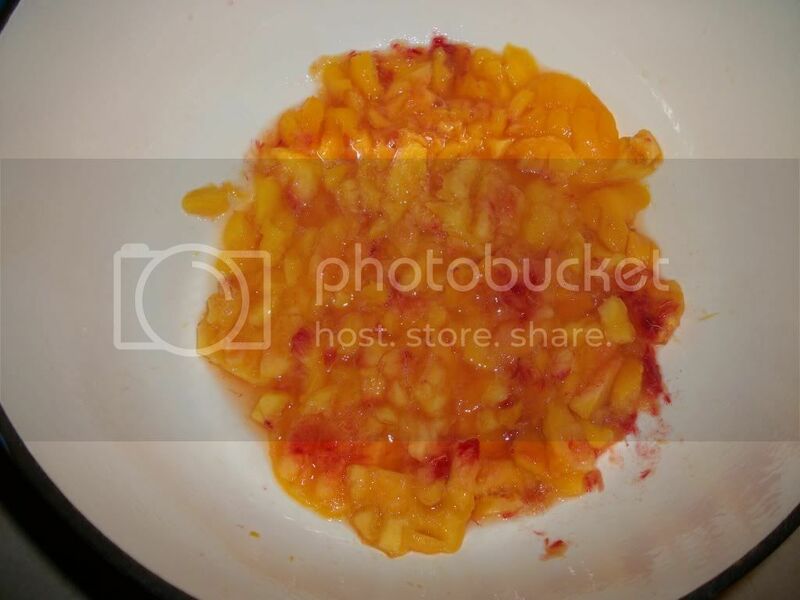 My recipe called for 12 peaches and I got about the same amout of jelly, so I would say 12 if they are large, 20 if they are medium to small peaches. Place about 2 cups into your dutch oven and mash with a potato masher. 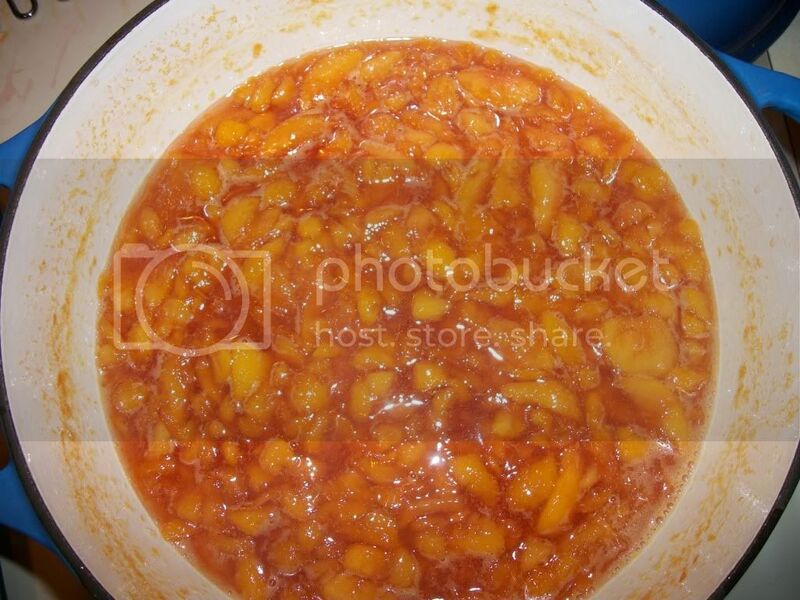 Then add the rest of your sliced peaches to the dutch oven. 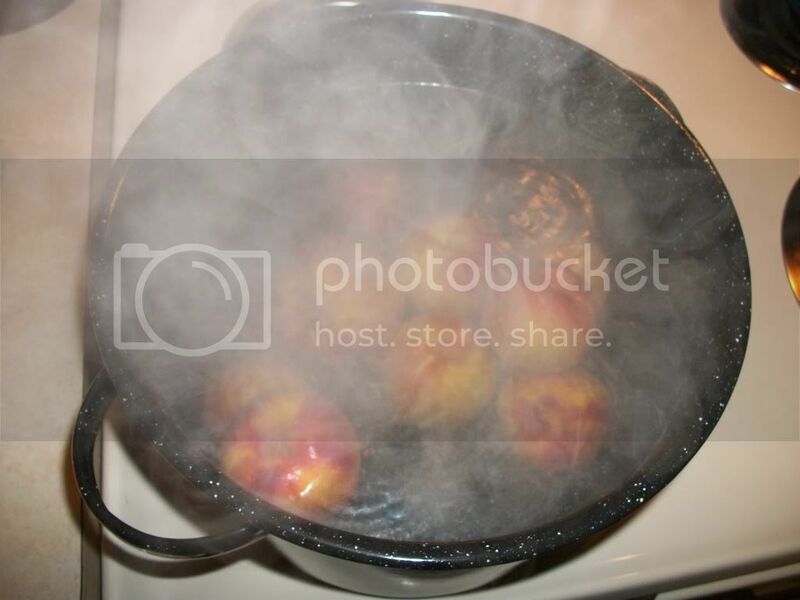 Over medium heat, bring your peach mixture to a boil and boil for 20 minutes. Then add in 4 1/2 cups of sugar. 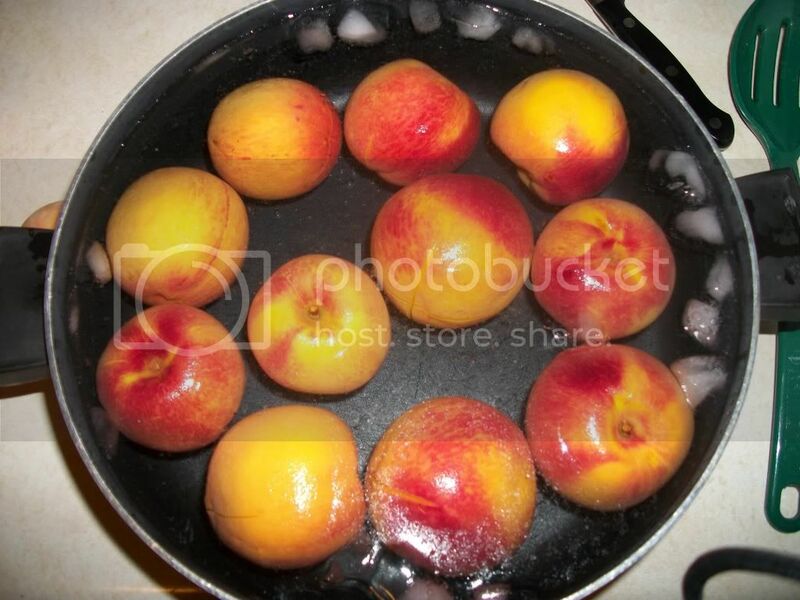 Please note you will need 6 cups of peach/liquid mixture, so I just quickly measured it out and then put it back in the dutch oven before adding the sugar. I had exactly 6 cups. Bring back to a boil and then add in 2 oz of pectin. I used liquid pectin this time, and I am not sure the difference between the dry and liquid pectin. We will see how it turns out later when I crack these bottles open. If you have any tips with using pectin, please share. 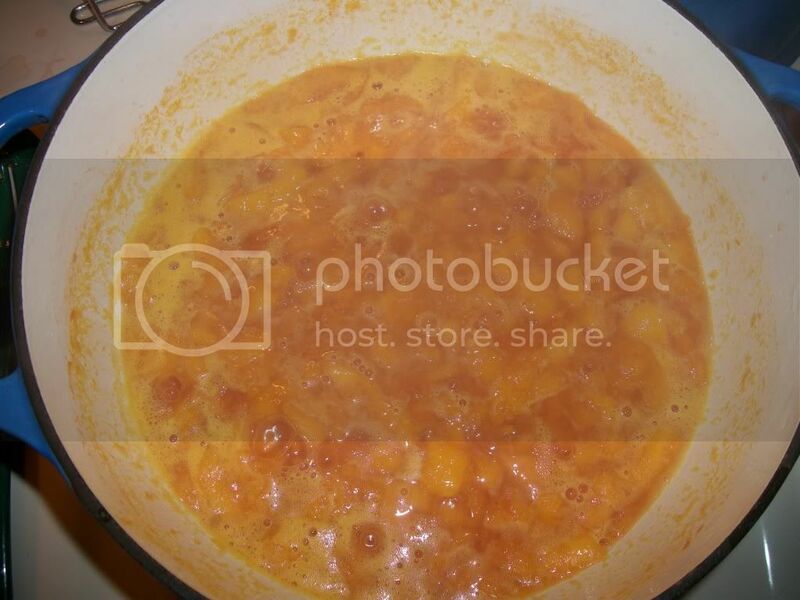 While your mixture if boiling, you need to bring some water up to boil in your stock pot for processing. I add the empty jars/lids/rings into the water so it sterilizes them, and also brings them up to temperature so the glass doesn't crack when you put in the hot jelly. 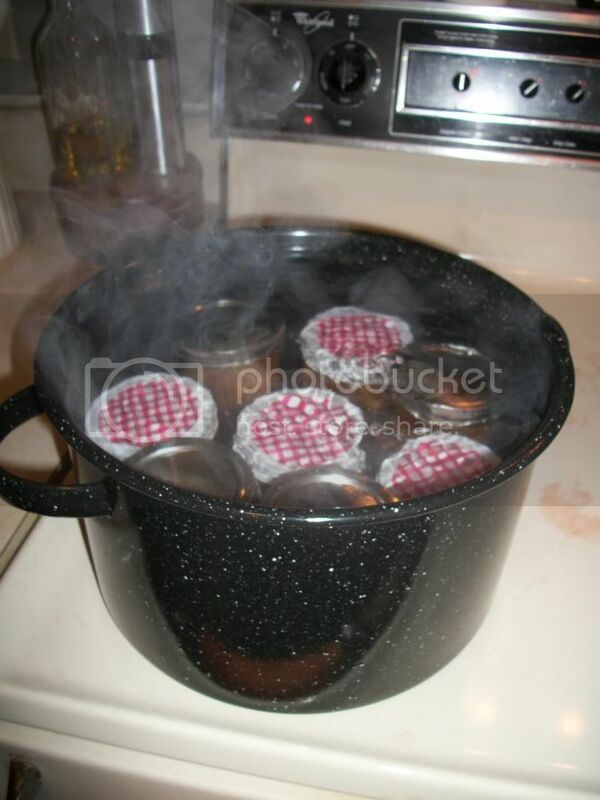 After you fill them, you need to add the jars back to the boiling water and boil for 10 minutes. Then turn off the heat and let them cool in the water. Keep an eye on it because sometimes my lids pop up. I just push them back down and they typically stay. You will hear them popping, so just stay in the room for about 20 or 30 mins or so to keep an eye on them and you should be ok. I always get nervous they are not going to seal, and I do have some that pop up, but they always seem to go back down. Here are my beauties. I ended up sealing up 8 small jars and kept one of them to enjoy now. If you do have the time and patience, canning isn't very hard and you can enjoy your results through the long-hard winters.